When a bank robbery goes south, these two misfits meet and form one of the unlikeliest friendships imaginable. While everything in the world has changed for Peter, he finds a measure of stability with Joshua, not realising that Joshua's past is dark and deadly ... and much closer to catching up with him than he realises. Power corrupts, or so they say. What would you do if you had the power to do anything and the only thing stopping your own dark side taking over was your memory of light? On the surface this looks like another super hero novel. It's not. As well as exploring the bonds of friendship and necessity, of what it means to be super-human and thoroughly outcast because of it, this book looks at what it means to be created in the image of the super-villain, and the refusal to give in to ones base nature. This is a tightly plotted, sharp and engaging novel with two likeable and strange main characters who form an unlikely friendship. 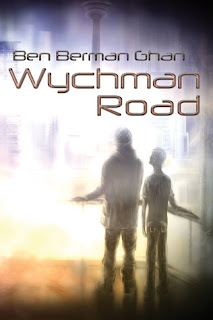 If you like sci-fi and super hero/villain novels then you'll enjoy Wychman Road. This was fun but asked deep questions on just how much humanity you'd be willing to sacrifice for power. Great stuff. It's probably personal but it missed out on half a star with me brecause of a few minor dips in pace however this didn't spoil my overall enjoyment of the book. I loved it and highly recommend it.